PoolPicker is an interesting service that keeps track of multiple automatic profitability switching pools and reports their profitability per MHS hashrate on a daily basis as compared to directly mining for Litecoin. 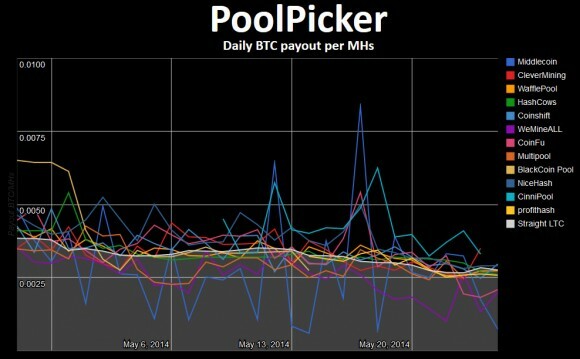 With the help of that service you can get a quick glance at where it is more profitable to mine on and you have history to see if a specific pool’s performance is poor and not worth mining at all on the long run. Of course the service does not cover all of the automatic profit switching pools, in fact is only covers 12 pools from the many more available ones. But with the available data in PoolPicker you could also compare to a pool that is not listed based on your own earnings or based on the officially reported profitability by the specific pool (if it supports that). So definitely something worth checking out if you still haven’t seen the service and are currently mining on a multipool.